Yesterday I’ve animated this skeleton. The steps involved were rather complex, so I thought I’d better write down how I did it. Here’s how I did it step by step. It all started in DAZ Studio where I’ve applied an aniMate Idles block to the M4 skeleton. I’ve also added Predatron’s Essential Lights and Skies because good looking lighting is a bit of a mystery to me. Because it’s a lot of cloth, the draping takes a little longer. 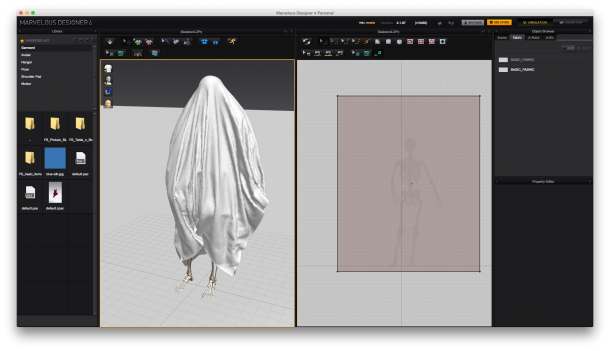 When it’s done, I’m exporting the cloth as OBJ sequence and import it again using Morph Loader into DAZ Studio. 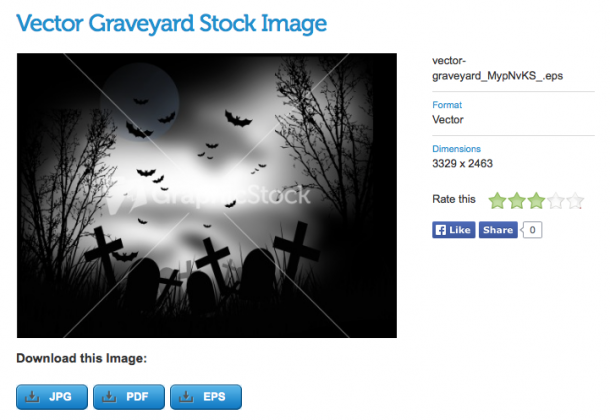 It becomes an animation with the help of Marcus Wilm’s animMorph script. I was thinking of using the new NVIDIA Iray engine for rendering in DAZ Studio 4.8, but it takes a long time and doesn’t do transparency yet. I used 3Delight – it’s been good to me for the last decade, why would it stop now. I rendered it at 1080p with the ground disabled. 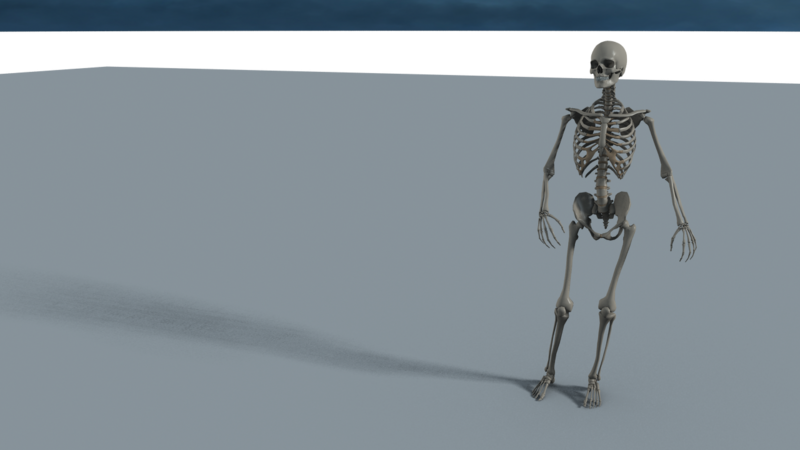 All the render showed was the skeleton and the sky, but including the vital shadow the skeleton throws. The whole render took over three hours in 1920×1080 – I was asleep when this happened. Usually animations don’t look great without some postwork. I thought it would be quite funny if the skeleton had been left on the graveyard somewhere with the cloth on, wondering what was going on. I only needed the bottom bit with the tombstones and removed the rest. I did this by selecting the black parts with the magic wand, inverting the selection and removing everything that was not black. Then I added a layer mask and drew on it with a soft brush so it would bend into my non-transparent parts of the image (the sky and the skeleton). 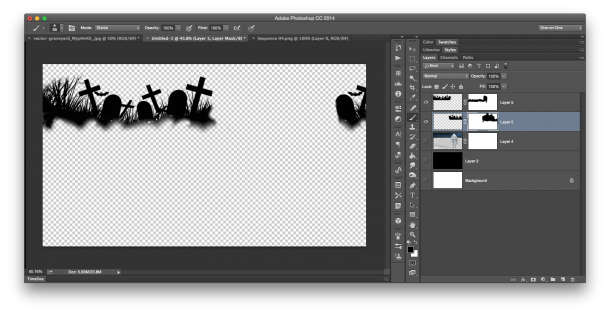 To preview those areas I’ve added my skeleton as a layer. Some parts of the image were replicated on the right. To make it look more creepy I thought some slow moving fog would be perfect. 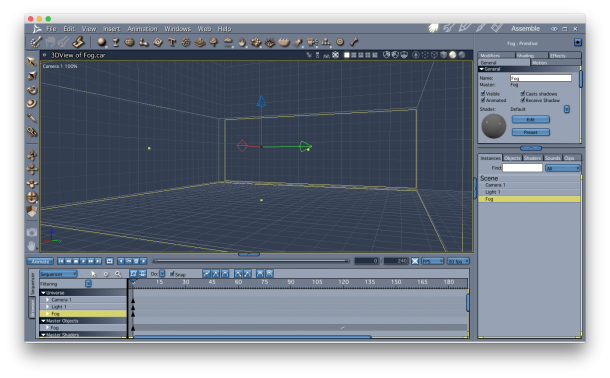 Carrara can do this with a primitive and it’s fairly fast to animate (less than 10 minutes). My intention was to bend everything together using Premiere anyway, so there was no need ti import anything into Carrara. All I needed was the right image size and a rough duration. We won’t even see anything in Carrara unless we render the image. I did some experimenting, and a block that fills the entire scene works well.  The only thing to remember when rendering the animation is that we need that alpha channel to retain transparency – otherwise we’ll simply see a black image with white fog. 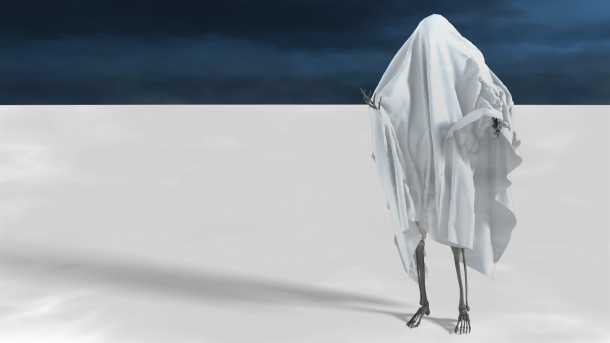 With transparency enabled, we’ll see fog on a transparent background – which will be replaced with the DAZ Studio render. 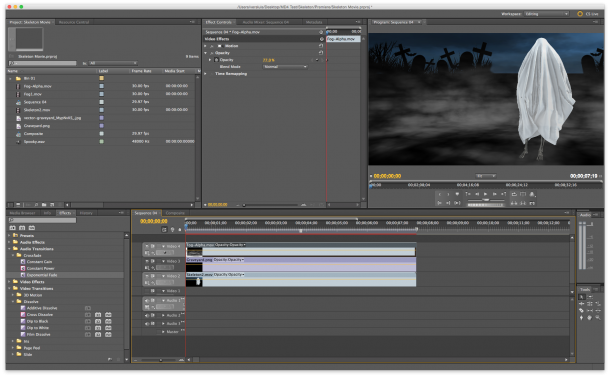 The final step was to put it all together in Premiere. It doesn’t really matter what type of sequence preset is used as long as it’s 16:9, we’ll change the parameters for frame rate and size upon export. Much like in Photoshop, each animation is layered on top of each other in the timeline, using separate video tracks. I’m using two sequences: one holds all these layers, including effects and opacity adjustments, and another is used to loop the animation and add “fade to black” effects. I’ve also added a sound effect from iMovie (crickets chirping).